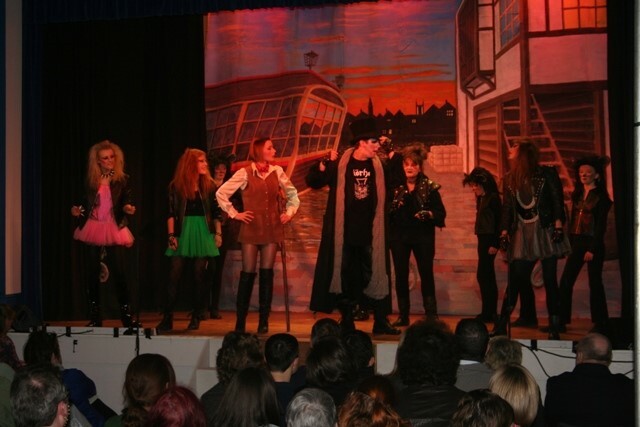 This prompted a search through the Bishopthorpe Archive for photographs, some of which we share with you below. 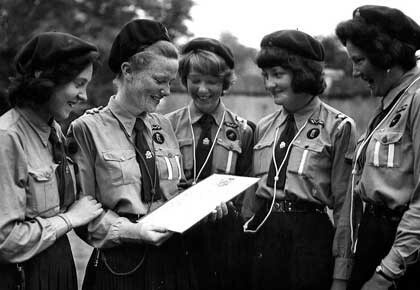 In 1944 the Girl Guides and Brownies, pictured above, were invited to join the Bishopthorpe Armistice Day Parade. This included the local members of the Home Guard, the National Fire Service, Civil Defence and the be-medalled ex-servicemen from the First World War. Following a service in St. Andrew’s Church, they marched through the village to the Palace where photographs were taken of all the units. We know the names of most of the girls in the photograph, including the two adults who are Myrtle Simpson (left) and Jean Hudson (right). Bishopthorpe Guides Pauline Horton, Margaret Colton and Isobel Wilmot congratulate Jane Standing on gaining her Queen’s Guide Award. Introduced in 1946, this award is the highest that can be earned in the Guide movement. It involves completing a series of tough challenges within a three-year period. Bishopthorpe Guides march down Davygate to the Minster where Scouts and Guides from the York area gather for the St. George’s Day service. 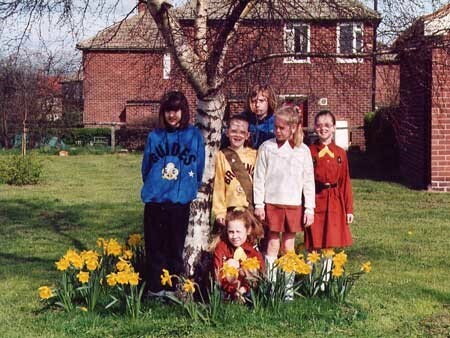 In 1991, a large number of daffodil bulbs were given to the Brownies and Guides of this district. Mrs. Overfield, who helped with the Bishopthorpe Brownies, suggested that the bulbs should be planted around the base of trees in Maple Avenue and Vernon Close. This would add some spring-time colour to an area where so many elderly people lived. The planting ceremony was attended by important guests including the chairman of Selby District Council and the Guide’s Division Commissioner. For one scary moment at the ceremony, the Brownies and Guides thought they wouldn’t be able to dig the holes because the ground was too hard! However, Mr. Melemendjian came to the rescue and the bulbs were eventually planted. The girls are seen above admiring the daffodills the following spring. 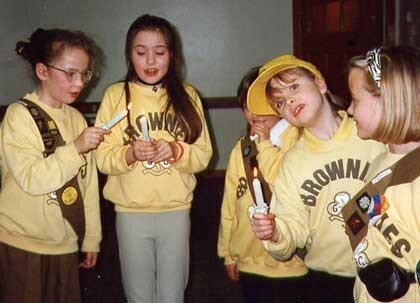 This photograph shows the 2nd Bishopthorpe Brownies lighting candles on Thinking Day. In this way, they remember the family of guiding throughout the world. Guides and Brownies concentrate on specific themes for each World Thinking Day – for instance this year – 2010 – it was ‘Poverty and Hunger’. The 22nd February was chosen for this special day because it was the birthday of both Robert Baden-Powell, the founder of the Boy Scouts, and his wife, Olave Baden-Powell, the first Chief Guide. 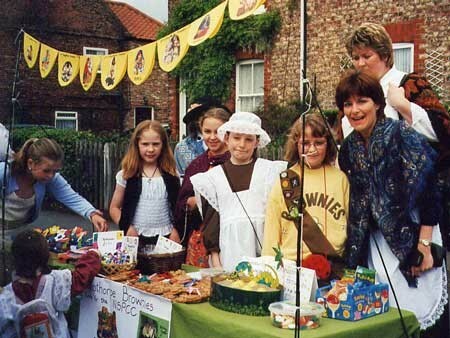 The Victorian Street Fair was part of the Bishopthorpe Millennium celebrations. 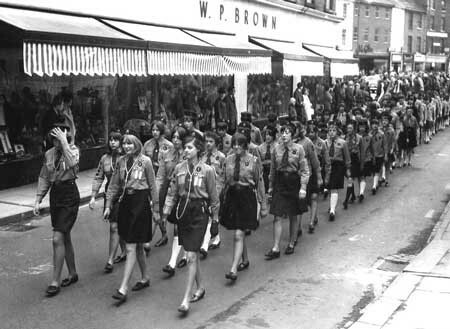 The Brownies set up their stall in Main Street and sold crafts they had made in aid of the N.S.P.C.C. With thanks to Janet Melemendjian, June Whittaker, Sylvia Overfield, Norman Antlett and The Yorkshire Evening Press for their help. Great to see the older photos. I believe that the un-named guide on the right of picture #2 is Naomi Standing, Jane’s sister. In picture #3 taken in 1967 I think that the girls in the front tow might be left to right Linda Hutchinson??. Elizabeth Oxtoby, Eve Hudson and in the second row could it be Margaret Antlett, Diane Scott and Elisabeth Pogmore and behind Elisabeth is it Carolyn Roberts? Can anyone else comment? 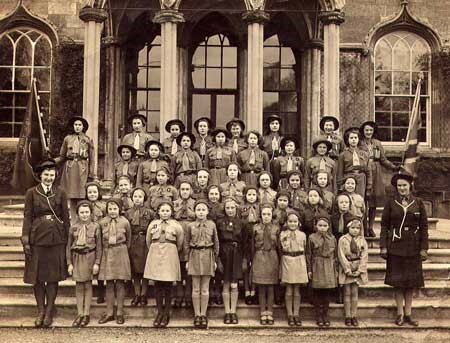 What a blast from the past seeing the 1944 Brownies & Girl Guides on the Palace steps. I was a member of both when I lived in Bishopthorpe and thoroughly enjoyed the experience. Don’t see myself in the photo though. Definitely remember Myrtle Simpson as our leader (“too-whit-too-whoo, clap”). 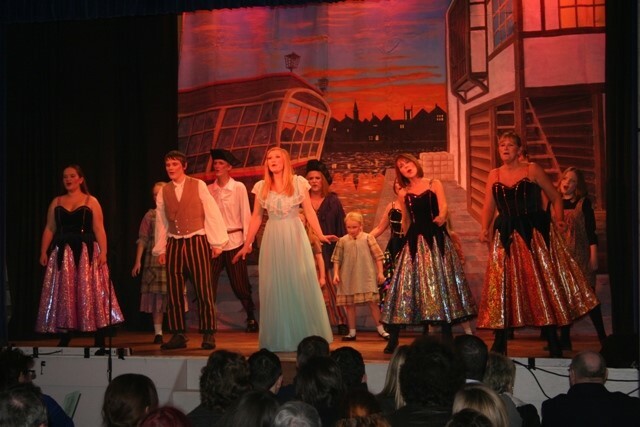 I love your website and it is wonderful to see the village residents continue these traditions, and still putting on plays.